We’ve seen shipping containers get transformed into indoor farms and tiny homes. Now they're even being used for school buildings, evidenced by a project taken on by Bard College in New York to create a media laboratory. All it took to create the structure were four shipping containers, one day, and $200,000. The project was headed by MB Architecture, a firm based in the United States that specializes in homes, housing, public spaces, and art projects. Design for the media lab came from the architecture firm's "Insta House" prototype built in 2009 in the Hamptons for a residential building with a bedroom on the second floor and living area on the first. For the university building, MB Architecture prefabricated the design, which was delivered and installed in only half a day. The result? Four shipping containers stacked two across and two high in order to create a large rectangle, with a connected floor plans adding up to 960 square feet of available space. Layout of the Bard College Media Lab is virtually the same as Insta House, with obvious adjustments made to accommodate the practical needs of a college building. The main room on the first floor has a windowed garage door that leads to a grassy area, meshing the indoor and outdoor space together. The second floor is sectioned off into separate offices and rooms. Bard College has a multi-use plan for the space, so the design was left very basic customizable for different departments' needs. The garage door additionally allows the space to be a venue for various events. The units were assembled in four hours last September 18th on a concrete foundation. Trim boards and plumbing were added over the next five days. And just like that, the space was be ready for students. 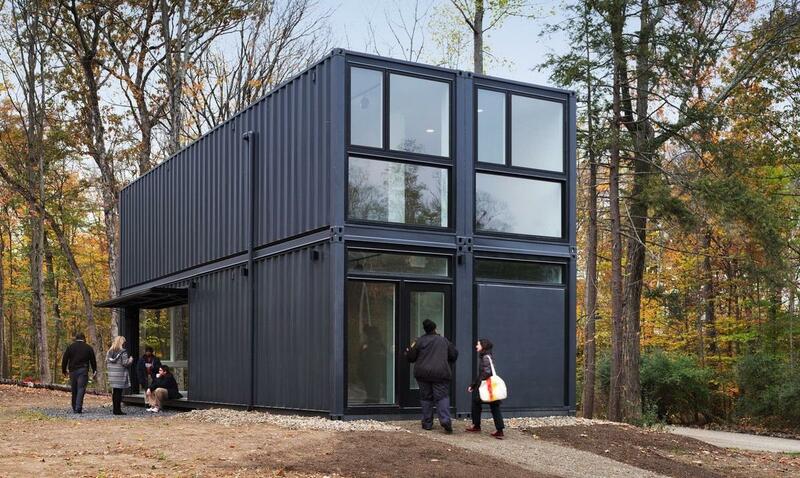 Shipping containers have certainly proved their versatility. MB Architecture’s Insta Houses can serve as a blueprint for hundreds of other projects, including additional university spaces such as administration offices and dorm rooms.